Fez has gathered quite a résumé for a game that hasn't sold even a single copy. A longstanding presence at conventions, it first caught the public's eye during the Independent Games Festival of 2008, when it received the award for Excellence in Visual Art. After it was featured among the PAX 10 at 2011's Penny Arcade Expo, the game went on to reappear at the IGF awards in 2012, receiving the coveted Seamus McNally Grand Prize amid heated controversy, most vocally from indie developer and critic Anna Anthropy. The general position held by detractors is that the purpose of the Independent Games Festival is to give indie games an opportunity for the kind of exposure that comes easily to high-budget titles with fancy publishing deals. Since Fez already garnered that attention back in 2008, the only consequence of its 2012 award is that a younger, less financially secure project has been robbed of its would-be spotlight. Despite this charged political backdrop, however, Polytron Corporation's baby remains on the short list of the most important indie releases expected this year. 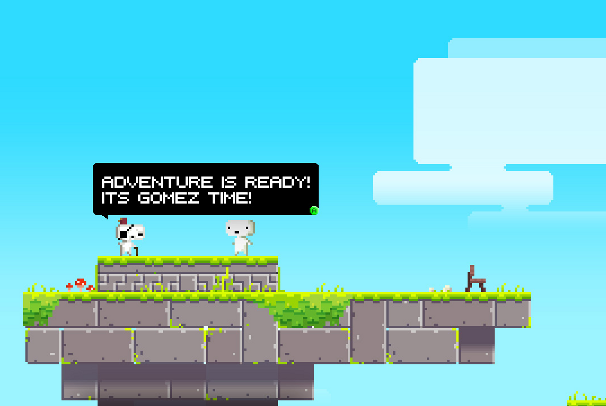 Fez presents vibrant 2D art and lush animation within the context of an intriguing perspective-rotating mechanic. Players explore the rich environments in search of cube fragments which seem to be essential to repairing the unraveling fabric of space. Identifying paths through the game becomes a complex puzzle, as the player tries to hold a 3D composite image in mind while traversing areas in 2D and rotating the world itself around the protagonist, Gomez. The result is similar to that seen in games like Echochrome, where the 3D landscapes are effectively crushed to allow for artificial Escherian spatial connections based solely upon the currently visible relationships between objects. Edwin A. Abbott's seminal novella Flatland—which deftly teaches readers to imagine the nature of a four-dimensional existence by extrapolating the observations of a 2D character witnessing a godlike 3D being as it intersects with the plane of its reality—has been adapted into videogame form before, but Fez might just be the first interactive analogue to match its ambition as it explores geometric themes simultaneously through gameplay and story. Featuring a score from my favorite chiptunes composer, Rich Vreeland (AKA Disasterpeace), Fez promises to be both beautiful and fascinating. It's been nearly five years since the game was announced in 2007, but we'll all finally have the chance to play it for ourselves when it is released exclusively through XBLA on April 13th.